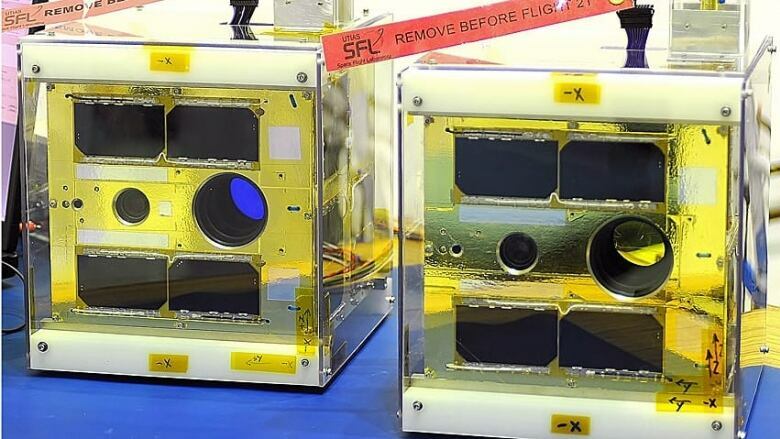 They are no bigger than a lunch box or a big suitcase respectively, but small high-tech satellites that will blast into space aboard an Indian rocket on Monday carry significant expectations for Canada's future in space. The BRITE and NEOSSat satellites will try to peer deep into stars and spot asteroids, other satellites and space debris. They also point to an emerging trend in the private- and public-sector space industries as budgets shrink and technology advances. "I think we're showing that you can do really exciting things in space without the big budgets that people tend to associate with space programs," says Cordell Grant, satellite systems manager at the Space Flight Laboratory at the University of Toronto Institute for Aerospace Studies. Grant will be waiting — a wee bit nervously — as a rocket blasts off Monday from Satish Dhawan Space Centre on the east coast of India. Inside the rocket's carefully stacked payload, along with two other satellites with significant Canadian ties, will be two nano-satellites that were designed at his lab. Each of these nano satellites is a 20-centimetre aluminum cube about the size of a lunch box — the smallest astronomical satellite ever built. It weighs slightly less than seven kilograms and contains a telescope about 20 centimetres long, along with the technology needed to help point it at its targets: the stars that are most visible from Earth. Solar cells on the outside can generate the 10 watts of power needed to run the devices as they orbit Earth every 100 minutes or so and measure the brightness of those stars to learn more about their inner workings. The BRITE satellites have been in production since 2005, and are part of a complex international scientific relationship that sees most of the funding for this portion of the project come from Austrian sources, while much of the technological expertise comes from Canada. In space terms, where an International Space Station can cost $150 billion, the BRITEs are relatively cheap, clocking in at between $1 milllion and $2 million for each nano-satellite. "There's a lot of interest in the space community in general in what can be done with smaller satellites because as economic times are tighter, then people tend to look at space programs that are spending a lot of money and say how can we avoid spending that money but do useful things," says Grant. The BRITE satellites will be going into orbit Monday along with two other satellites with a significant Canadian pedigree: NEOSsat and Sapphire. When a meteor streaked across the Russian sky more than a week ago, it caught everyone off guard. While advance warning would have been welcome, the space watchdog NEOSsat won't offer many early hints of similar sudden arrivals from the outer limits. NEOSSat aims to track, study and catalogue asteroids and comets, which are considerably larger than meteors, says Guennadi Kroupnik of the Canadian Space Agency. The Canadian Space Agency and Defence Research Development Canada will use NEOSsat — or the Near-Earth Object Surveillance Satellite — to try to spot asteroids and track high-altitude satellites and space debris. The 73-kilogram microsatellite is the size of a small suitcase, runs on about 80 watts of power and follows in the space footsteps of MOST, a 60-kilogram star-watching device launched a decade ago and still gathering data. Sapphire, a box-like structure that weighs in at 150 kilograms, is the Department of National Defence's first dedicated operational military satellite. "It represents an important milestone in the development of Canada’s space-based military capabilities," Defence Minister Peter MacKay said in October, when the satellite was being sent off from Ottawa to India for the launch. "Sapphire will collect information on deep-space objects, and share it with the U.S. Space Surveillance Network. This integration of information will help increase the ability of both Canada and the U.S. to protect their assets and interests in space by preventing collisions." The project, which cost more than $65 million, will track space debris that could collide with satellites used for telecommunications, weather, Earth observation and GPS. Guennadi Kroupnik, director of satellite communication and space environment projects for the Canadian Space Agency, says NEOSsat has been designed to work for a year, but with the hope that it will survive much longer. Cost for the NEOSsat project, from inception to end of its useful life, is estimated at $24 million. The satellite will be on the lookout for asteroids and comets between the sun and Earth, along with other satellites and space junk "in order to track and ensure security of space assets being threatened by space debris," Kroupnik says. That threat has increased significantly over the past few years, Kroupnik says, noting the 2007 test of an anti-satellite weapon by China's Ministry of Defence and a satellite collision involving Russian equipment that left debris behind. The Indian Polar Satellite Launch Vehicle carrying the Canadian satellites to space is doing something of a milk run, boosting seven satellites in total into their orbits, which should take place about 15 minutes after liftoff Monday. Along with the Canadian projects, there is a joint French-Indian satellite (SARAL), and two smaller satellites from the U.K. and Denmark in the payload. Canada doesn't have the facilities to launch anything into space, and the cost and availability of Indian rockets have proved attractive for the CSA and projects such as Grant's. The BRITE satellites are the first two of a six-satellite plan, and Grant hopes the remaining ones will be launched within a year. All of them have been designed to last two years, but with the hope they could live on. "If it lasts for two years then there's really no reason it can't last longer," says Grant. "There's nothing on board that's going to run out like fuel or anything like that. So as long as everything is healthy, it could last quite a bit longer." Grant sees the BRITE project having the potential to open up a new market for "low-cost, high-performance satellites." Kroupnik says it's premature to consider that smaller satellites will be able to replace larger platforms in the short or middle term. But he sees them complementing larger satellites and expects the number of smaller ones blasting off will grow. "It's a very dynamic field and we'll see most probably more and more smaller satellites flying to space." What is Canada's future in space?